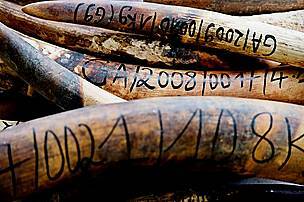 Increasingly recognised as the main enabler of wildlife crime, corruption is gaining increasing prominence in the global conservation agenda with a series of high level international agreements highlighting its critical role in facilitating wildlife crime. Despite this global policy focus, anti-corruption approaches are still not being effectively incorporated into conservation planning. One of the main reasons is a lack of strategic collaboration between conservationists and anti-corruption experts – a fact that is highlighted in a new publication by the U4 Anti-Corruption Resource Centre and will be discussed by a high level panel at the 17th International Anti-Corruption Conference (IACC) in Panama on December 2nd. 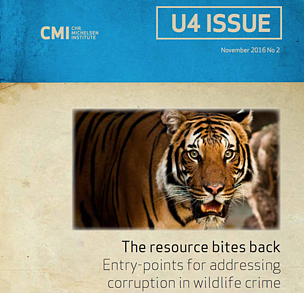 Published this week, The resource bites back: Entry-points for addressing corruption in wildlife crime identifies entry-points for addressing corruption in wildlife crime based on recent anti-corruption effectiveness literature, including the establishment of credible corruption risk assessment and corruption risk management procedures to improve wildlife conservation programming. Written by Aled Williams (U4/Chr. 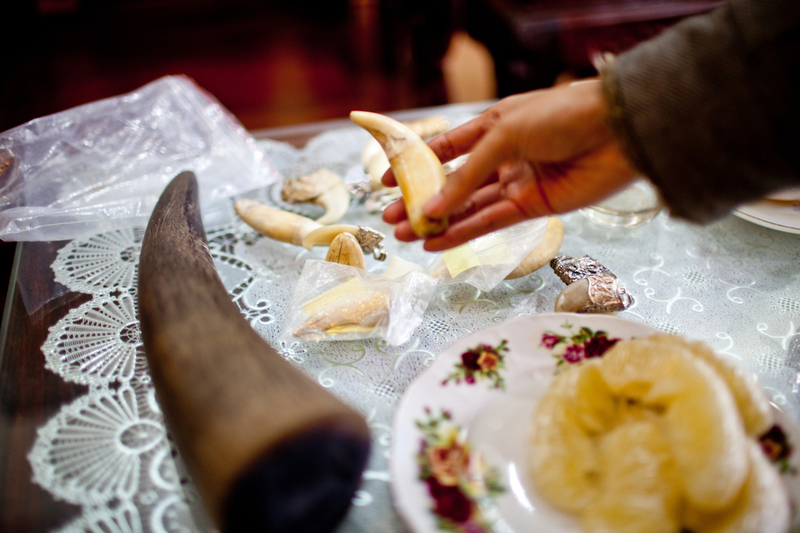 Michelsen Institute), Rob Parry-Jones (WWF Wildlife Crime Initiative) and Dilys Roe (International Institute for Environment and Development), the publication details how existing studies tend to discuss corruption associated with wildlife crime through a conservation lens. 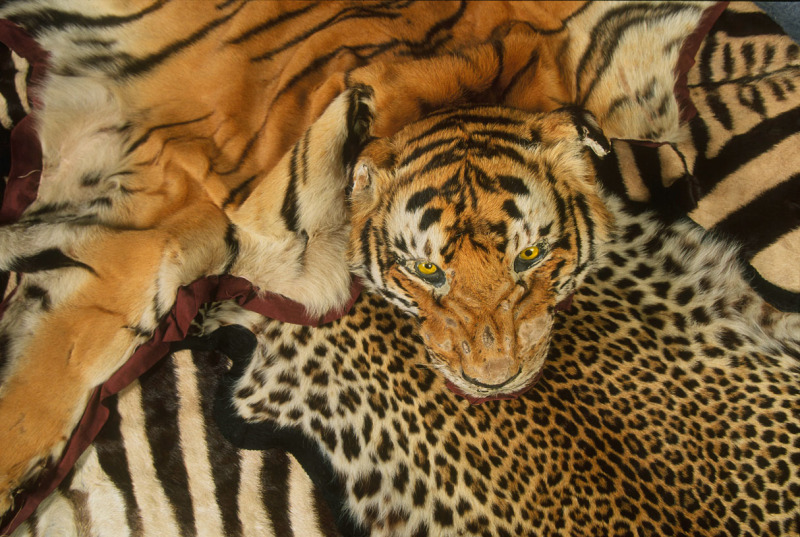 “Only very few discuss corruption and wildlife crime through an explicit anti-corruption lens and even here, the majority of authors come from a conservation rather than an anti-corruption background,” say the authors. Researchers, policy-makers and practitioners in each of these communities can play a role in generating new and useful empirical evidence, in sharing lessons from experience, in proposing and helping implement innovative policy and practice solutions, and in monitoring and evaluating the effectiveness of these interventions over time. While there have been some recent efforts to enhance cross-fertilization – particularly through the newly-created 3C Network for Countering Conservation-related Corruption that was convened by WWF International, Transparency International-UK and the Durrell Institute of Conservation and Ecology (DICE) – there is still limited exposure of the wildlife conservation community to the most recent anti-corruption effectiveness debates and vice versa. This is why the cross-sectoral workshop at the IACC on corruption and illicit financial flows in wildlife crime, including fisheries, is so critical. For the first time, this topic will be on the official agenda of the conference – the world’s premier forum for civil society, governments and the private sector working together to fight corruption. Entitled Shared planet, shared responsibility: creating multi-stakeholder alliances to combat wildlife, forest and fisheries crime, the workshop is a collaborative multi-stakeholder approach from a consortium of 11 partners, coordinated by WWF under the auspices of the 3C network. It will bring renowned experts from across the globe together to seek to identify solutions and highlight shared responsibility across the wildlife conservation, anti-corruption, anti-illicit trade, and anti-organized crime communities. 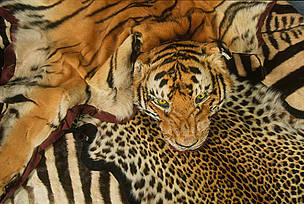 Along with enhancing everyone’s understanding of the types of corruption in the wildlife sector and their environmental and human impact, the session will focus attention on the illicit finance/resource flows and the link to over-exploitation of natural resources and corruption at all stages of the value chain. Critically, the session will also explore solutions to addressing, discouraging and preventing corruption as well as illicit financial flows as a key route to unsustainable resource exploitation, and provide a basis for new partnerships to pursue clearly identified opportunities. Juan Carlos Navarro was the former Mayor of Panama City, originally elected for a five-year term (1999-2004) and re-elected in May 2004 (2004-2009). He was the youngest citizen ever elected to the Mayor’s office. He founded the National Association for the Conservation of Nature (ANCON) in 1985, and was appointed by the President of Panama as the first Environmental Ambassador of his country to advise key officials on national and international environmental policy (1995-2000). He was World Conservation Union (IUCN) Regional Councillor for Latin America in 1990, re-elected in 1994, the first Panamanian and youngest member elected to the Council. Mrs. Dorcas Agik Oduor is the Deputy Director Public Prosecutions and Head of Economic, International and Emerging Crimes at the Office of the Director of Public Prosecutions. A career Prosecution Counsel, Mrs. Oduor has previously served in the Public Prosecutions space for more than 12 years having begun her career as a State Counsel in 1991. She holds a Master Degree in International Conflict Management and an LL.B Degree from the University of Nairobi alongside a Law Diploma, from the Kenya School of Law. Candice Welsch is the Chief of the Implementation Support Section of the Corruption and Economic Crime Branch of the United Nations Office on Drugs and Crime (UNODC). She leads a team based in both Vienna and the field that is responsible for providing technical assistance to countries in preventing and combating corruption under the United Nations Convention against Corruption. Dr. Gail Lugten is Associate Dean in the Faculty of Law, University of Tasmania. From 2011 to 2014 she was employed as Regional Fisheries Body Liaison Officer for the UNFAO in Rome. In this capacity, she was the head of the FAO RFB Task Force and the Secretary of the Regional Fisheries Body Secretariats’ Network (RSN). She is the author of numerous academic papers and UNFAO reports and she has been a RFB consultant to PEW, WWF, UNODC and UNEP. Dr Lugten has also presented papers at both Chatham House and the International Tribunal for the Law of the Sea. Sebastian Wegner is Policy Coordinator for the Fisheries Transparency Initiative (FiTI) at HUMBOLDT-VIADRINA Governance Platform, with a focus on stewarding multi-stakeholder processes towards establishing global standards increasing transparency in access to marine fisheries. Previously, he has worked as a consultant for the German Global Compact Network establishing Anti-Corruption Sponsoring Guide for Companies operating in Germany, for the German Development Cooperation / Alliance for Integrity, Piloting Alliance for Integrity in India, and for Transparency International – Supporting establishment of country assessment framework Business Anti-Corruption Country Agenda. Tom Keatinge is Director of the Centre for Financial Crime and Security Studies at the Royal United Services Institute for Defence and Security Studies. He was formerly a managing director in the Financial Institutions Group and head of European public sector client coverage at J.P. Morgan, and has a Master's Degree in Intelligence and International Security at King’s College London. His research covers themes including: corruption and international security; and the use of financial tools to disrupt illicit wildlife trade. He currently leads a year-long project focused on disrupting the illicit financial flows linked to wildlife trafficking in East Africa. James Swenson is Head of Financial Crime and Reputational Risk Managed Services. He is a Certified Anti-Money Laundering Specialist (CAMS) and has substantial experience designing due diligence programs complying with FCPA, UK Bribery Act, AML, and supply chain risk management. James has been with the business since 2006 having moved from Hong Kong, where he worked as a senior case manager to London in 2009 to oversee the company’s European expansion.